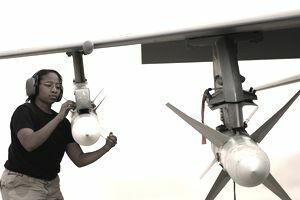 Services and maintains, or supervises these actions on missiles, unmanned air vehicles (UAV), boosters, payloads, research and development (R&D) systems, environmental blast doors and valves, associated subsystems, components, and support equipment (SE). Launches, tracks, and recovers UAVs. Operates and maintains related equipment. Performs acquisition and activation activities. Related DoD Occupational Subgroup: 163200. Performs missile maintenance actions at flight line, railhead, support base, and launch, launch control, and storage facilities, and ensures compliance with international treaties. Inspects, repairs, adjusts, and replaces, or supervises these actions, on components and subcomponents. Mechanically or electrically connects or disconnects reentry systems, guidance and control sections, missile stages, propulsion systems, and secondary ordnance devices at the launch facility. Prepares missile and launch facility for simulated launch and follow-on test and evaluation. Performs preventive maintenance inspections and electrical tests on missiles; missile components; launch and launch control facilities; support vehicles; hydraulic, pneudraulic, and pneumatic systems; and SE. Initiates unsatisfactory reports, failure reports, or proposed modifications. Performs intercontinental ballistic missile (ICBM) coding activities. Supervises transportation, assembly, and inspection of booster and payload functions, their subsystems, and SE. Directs and controls activities of contractor personnel during space launch activities. Supervises loading, transportation, unloading, inspection, assembly, and hoisting of boosters, payloads, component parts, and satellites at space launch facilities; preparation of space launch complexes; and erection and mating of booster sections, payloads, and SE. Supervises or performs preventive maintenance inspections. Practices and supervises safety procedures when handling nitrogen, liquid fuels, oxidizers, and ordnance devices. Uses technical publications to evaluate malfunctions, and recommends corrective action. Performs and evaluates laboratory R&D activities. Assembles, installs, and tests R & D systems such as laser, electromagnetic launcher, energetic materials, propulsion, high powered microwave, satellite, telescope, and pointing and tracking. Maintains and resolves SE problems such as data acquisition, fiber optic, instrumentation, wind tunnel, high and low-pressure gas, propellant mixing and molding, and exotic fuel storage systems. Knowledge is mandatory of oxidizers and fuels properties and characteristics; basic hydraulics, pneudraulics, pneumatics, mechanics, and electricity; missile propulsion principles; and use of diagrams and schematics. Education:. For entry into this specialty, completion of high school with courses in mathematics and physics is desirable. Training:. For award of AFSC 2M032 or 2M032A, completion of a specific, basic 3 level missile and space systems maintenance course is mandatory. Experience:. The following experience is mandatory for award of the AFSC indicated: (Note: See Explanation of Air Force Specialty Codes). 2M052. Qualification in and possession of AFSC 2M032/32A. Also, experience in functions such as missile, space launch, R&D, and UAV maintenance, launch control, or preparation of launch facilities. 2M072. Qualification in and possession of AFSC 2M052. Also, experience performing or supervising missile maintenance, space lift, or laboratory R & D activities. For entry into this specialty, normal color vision as defined in AFI 48-123, Medical Examination and Standards. For entry, award, and retention of AFSCs 2M012/32/52 or 2M012A/32A no record of emotional instability. For award and retention of AFSCs 2M032/52/72 or 2M032A eligibility for a Top Secret security clearance, according to AFI 31-501, Personnel Security Program Management. Note: This job requires a Sensitive Job Code- (SJC) of "F."